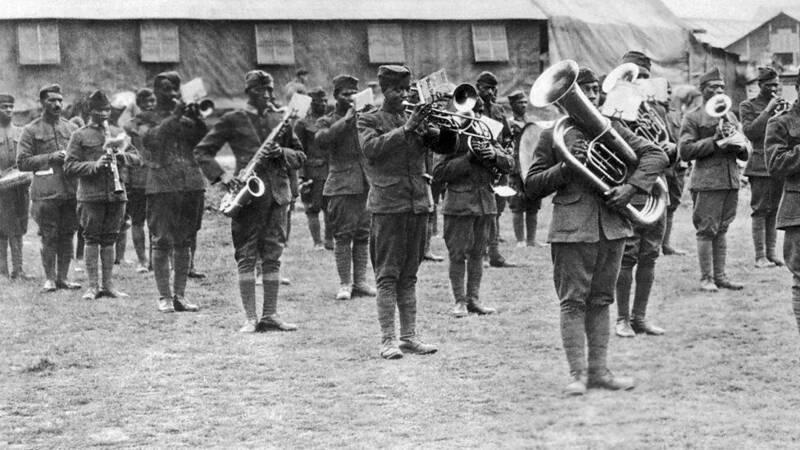 The 369th Infantry "Harlem Hellfighters" Band, led by James Reese Europe. November 11, 2018 was the 100th anniversary of the signing of the Armistice, which ended World War I and marked a turning point after which came the reality of the 20th century. What effect did this have on the bourgeoning music of this new century—the music known as “jazz”? It is my belief we can look at the Armistice as a marker, investigating the before and after—when jazz grew from an unruly child into a mature art form. Delving further we can see that there were ripples and even large waves that emanated from the war’s ending that left its mark on the music. The Armistice, which came about suddenly, brought euphoria and a sigh of relief. The sudden optimism and sense of freedom and peace allowed for the permissiveness that would become associated with the 1920s and with the flowering of this music. And along with relief came a jolt, a shock to the old staid culture. When the boys came marching home, they faced a new and promising future. In Europe, they left the old world order, aristocracy, and culture a shambles. At home, they encountered a new sense of freedom that likewise left behind stifling pre-war restrictions and culture. The Jazz Age was looming in the future, bringing dancing, music, art, and cultural sensibilities up-to-date, for better or for worse. “Jazz,” at the time, meant a lot of different things. Very few understood it to mean the New Orleans-style dance music recently imported to Chicago. By and large, the term at that time referred to ragtime-style dance music, but of a disorderly and invasive nature beyond that of ragtime. It was something that youth embraced, the old guard warned against, and working professional musicians feared. To the American public of circa 1918 “jazz” was a confusing word that functioned alternatively as verb, noun, or adjective. So, as I speak of “jazz” during the World War I era, I am not necessarily referring to classic New Orleans type jazz, or even a precursor of it. Rather, I am thinking all-inclusively, covering any sort of boisterous, rebellious, or counter-culture music. An important thing to remember is that during the 1910s, jazz was synonymous with dance music, although the reciprocal was not always true—all dance music was not considered jazz. And, American popular dance music of the 1910s, whether known as ragtime, jazz, or any of the various strains of Latin-style dances, consistently gathered momentum as it swept through the war years. The Armistice marked a significant change in the way people danced. Ballroom dancing, which influenced and was influenced by jazz evolved during the period between 1914 and 1920; perhaps more profoundly than any other six year interval during the 20th and 21st centuries! The Castles, Vernon and Irene, streamlined much of the bulky ballroom moves that characterized the popular “animal dances,” i.e., turkey trot, etc., and created a sense of refined elegance. But then, as the decade grew to a close, “jazz dancing” largely undid what the Castles worked so hard for. The atmosphere of relief and freedom gave way to a far more loose style. Along with dance styles, there were major changes in instrumentation used by dance orchestras. Change came swiftly: dance bands finally shed the old-style instrumentation, making trumpets (or cornets) the lead voice, and the saxophone—previously thought of as a novelty—began to take hold. During the period from ca. 1895 to about 1914, dance orchestras were outfitted not unlike symphony orchestras, with 1st and 2nd violins, woodwinds, brass, and percussion. Melody was mainly carried out by violins. As the 1910s got underway, the cornet (or trumpet), which previously had a subordinate role, became the lead voice. Suddenly, melody became a whole lot brassier. This brazen quality was bolstered by the appearance of the saxophone, which had been looked as a novelty and comic instrument. At first there was no role for the saxophone, it usually doubled the lead or played long notes or counter melodies. As the 1920s dawned, multiple saxophones began to displace first and second violins. Another major change concerned the fox trot, a relatively new step that was introduced around 1915. At first its rhythm was akin to the old fashioned schottische, and had a clog-like feel. As the 1920s rolled around, the fox trot had smoothed and encouraged that couples hold each other even closer. Also, the fox trot’s versatility allowed it to be performed at almost any tempo. Also, the recording industry, which was greatly compromised during the war, bounced back stronger than ever. In 1918 the Victor Talking Machine Company’s total record sales had shrunk by about $6 million from the previous year, to $21,547,047. This was directly due to the mandatory use of the Victor plant to make armaments, rather than records and phonographs. However, in 1919, their total record sales exceeded any previous year at $30,851,527. Now let’s take a look at something I believe to be a major turning point—something that may really have been a catalyst in promoting the acceptance of jazz among the populace. We know that evolution occurs over time; there are no exact dates for the birth of a style, or the shift of an attitude. However, there was an event that defined the start of a new era; a time when Americans shifted their attitude to jazz and began to appreciate its musical value. It seems to me that the most direct effect on jazz, by the Armistice, stemmed from a single event that tied the two together. On February 17, 1919, the black regiment, the 369th Infantry with Lt. Jim Europe leading the “Hellfighters” band, participated in a highly publicized parade, marching up 5th Avenue from East 23rd street to Harlem. James Reese Europe, whom a decade earlier did so much to elevate the status of working black musicians, joined the first black regiment of the Great War. As a lieutenant in the 369th Infantry, he organized a concert band that gave played a raucous, engaging, and exciting form of “jazz.” They served in battle, as well as being morale boosters. The band’s triumphant welcome home, by blacks and whites, signaled a major shift. This, perhaps, was the first pervasive acceptance of jazz of any definition. Although black battalions were not allowed to serve and fight alongside white soldiers, this band made an enormous impression of white and black, American and French. Their U.S. tour, which ended sadly with Europe’s senseless death, brought a music labeled “jazz” before its most enthusiastic audience yet. Sheet music image from Library of Congress collection. It was during an intermission at Boston’s Mechanics Hall on May 9, that Europe was attacked by a disgruntled musician, wielding a pen knife. Europe’s wound at first seemed superficial, but it was anything but. He died but a few hours later. In an instant, Europe was gone, and shortly thereafter, the band broke up. The fervor and the thrill, both visceral and patriotic, of their music were forgotten. Jazz took a few steps backwards. Parents continued to warn their children about its lasciviousness, professional musicians continued to feel threatened by it, and the public still had no idea what exactly it was. But the Jim Europe mania did mark an important new chapter in the music. “Jazz” would soon become a noun and the earlier notion of “jazzing around,”(3) would slip away. By 1923, a notion began to emerge that jazz could be authentic—there was “real” jazz music to be heard. Recordings were released by bands that bore little to no resemblance of the noisy faux jazz of the 1918 – 1921 period. This evolution took time; it did not happen overnight. But the notion that jazz could be something Americans could be proud of came at the time when the Great War ended and the soldiers came marching home. 1. “French General Liked Jazz Band.” Dayton Daily News, April 13, 1919. 2. Boston Globe, reprinted from the Philadelphia Evening Bulletin, March 27, 1919. 3. Coincidentally, the phrase “Jazzin’ Around” was the title of a piece recorded in 1917 by pianist Eubie Blake, a protégé of James Reese Europe’s, who along with Noble Sissle, would do much to carry on Europe’s legacy with their hit show Shuffle Along.